The founder of Super Senior Connection, an online platform for seniors, inspires people of all ages with mental, physical and altruistic practices. 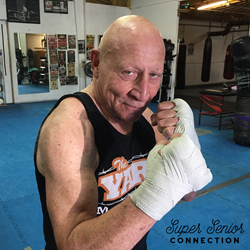 Arthur Stevens, the founder of Super Senior Connection, turned 78 years young this fall, and celebrated by training Muay Thai at The Yard, a world famous kickboxing center in Los Angeles, California. Stevens manifests a healthy lifestyle and exercise regimen to inspire people of all ages to stay productive members of society. Muay Thai, or Thai boxing, is a combat sport that uses stand-up striking along with various clinching techniques. It also referred to as “The Art of Eight Limbs,” because the sport involves using eight points of contact that represent the weapons of war. The physical and mental discipline that is required to endure and thrive in Muay Thai is not an easy feat, for the fighters deal with endless hours of practice, pain and injuries that require lots of determination and stamina. For Stevens’, practicing Muay Thai is a way to stay fit in mind and body, but this isn’t his only past time. An active member in society, he has been involved with many non-profit organizations throughout his life, with the ultimate goal of helping people and making the world a better place. To further his determination to living life to the fullest and encouraging others to do so as well, he launched Super Senior Connection, an online community for those who know life can be incredible and exciting at any age. Stevens noticed that often times the media is catered to youth and subsequently seniors are neglected on social networks. With the idea of connecting seniors worldwide, he created a platform for mature adults to expand their knowledge and encourage thought-provoking discussion. Super Senior invites all mature adults to register and start meeting fellow Super Seniors around the world through featured articles, user stories and discussion forums. For more information on Super Senior Connection, please visit their website.